You see, the real reason why I haven't revealed any photos of my decorated bedroom is that I don't want you to see photos of a pigsty, no matter how well its decorated. So today (well, after I finish this blog post and get outta bed) I'm going to dedicate the daylight hours to whipping this bedroom into shape. Cheers to Spring Cleaning! 2. De-clutter the desk, the dresser, the bookcase, the windowsills. I like to have a lot to look at. So I have lots of pretty little things strewn about the surfaces of my room. And some not-so-pretty things like unruly papers, receipts, empty paper coffee cup from the coffee shop next door, fingernail clippers, lotion bottles, etc. etc. etc. (Yes, I'm looking around and listing off everything I see that isn't so pretty to look at.) First, toss the trash. Then, put away the necessities---lotion, clippers, scissors all have their place. And when it comes to the pretty stuff, edit edit edit. Pack away some of the pretty things. You can always rotate it later on in for another season or time you feel like giving your room a mini makeover via accessory swapping. 3. Re-arrange. Take a moment to really think about whether or not the current furniture arrangement is suiting your needs. Is there enough floor space? 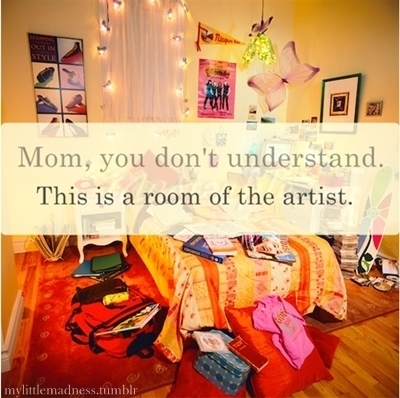 Does your room resemble a labyrinth? Does the laundry hamper pose as an obstacle to the door? Can you see the tv from your bed---can you not see the tv from your desk? Move stuff around a little. If you end up hating it, you can always switch it back. But take it from a compulsive furniture re-arranger---a little shifting around (even just two things changing places) can give the whole room a fresh new look and give you a fresh new outlook. 4. Organize. This is something that I may not get around to conquering today because it's a whole 'nother beast itself. It's one thing to put things away, it's another to put them away where they belong. Moving often completely de-organizes my belongings. And I've moved so much (three times in the last year!) that I no longer know where anything is. I plan to start with my desk and get all those papers organized. Blogging plans, school stuff, and important legal/tax documents shouldn't mingle on the desktop. I plan on bringing out the folders, labels, and getting my Storage on. (Yup, I'm referring to everything I learned during my internship at Storage magazine and pulling inspiration from all the nifty little projects we did to show readers how to be organized!) Next, I'll focus on the monster that is the random bags and boxes in my closet. Okay! There it is. A Spring Cleaning to-do list fit for dorm and apartment dwellers alike. If you decide to join me in conquering your closet and clutter, let me know how it goes! Or if you have any extra tips or ideas to add, leave 'em as a comment below! Omg, Jessica. #5 made me remember the dream I had last night (no joke). We were driving from El Azteca (surprise, surprise...but that is another funny part I will leave to when I see you) and you got pulled over because your license plate was flapping. So if that happens to be broken, fix it. Hahaha.